What in the name of all that’s holy is going on in Ukraine? The Kiev "government" – and I use the term loosely – is claiming to have killed over 300 "separatist militants" in the eastern city of Luhansk, and wounded 500 – an extremely dubious claim that even the pro-Kiev Western media is reporting skeptically. What can be verified is that the rebels have scored a number of successes, including driving Ukrainian border guards from their posts near the Russian border. All told, pro-Kiev military units were expelled from three eastern towns. "In a show of force," as the New York Times lamely put it, Ukrainian "acting president" Aleksander Turchynov showed up in the eastern pro-rebel city of Slovyansk – just as the rebels had downed a National Guard helicopter. "At a funeral on Wednesday for Alexander Gizai, one of the eight people killed by a Ukrainian airstrike two days before, anger hung in the air. ‘How could they use air power in the center of the city, in broad daylight, next to a jungle gym?’ asked a Russian literature teacher named Georgy, who had come to pay his respects to Mr. Gizai, and said he despised the separatists. ‘Ukraine was always divided. It was always hard to understand it as one country. Now it is even harder.’"
Now Kiev is braying and beating its chest, claiming to have murdered hundreds of people, when in fact its forces are in retreat and have lost control of the eastern part of the country. What can one say when a regime proudly claims to have committed war crimes – which are clearly, at best, exaggerations? Only that Ukraine has crossed the always vague border between the Twilight Zone and Bizarro World. That this bizarrely bloody series of events occurred as our President was canoodling in Warsaw with the Chocolate Oligarch, issuing a statement hailing events in Ukraine as "an incredible outpouring of democracy" merely serves to confirm our relocation to another dimension. It is the rebels, says Obama, not the coup leaders, who "have spurred great violence" – this was said as rockets fired from Ukrainian Air Force fighter jets rained down on civilians in the eastern part of the country. Hailing the election of Poroshenko, Obama averred Ukrainians have shown "they reject corruption." Even Poroshenko’s voters must be laughing at that one: more than one supporter told the Western media they supported the Choco-oligarch because he wouldn’t steal quite as much as the others. Far from rejecting corruption, the election results in western Ukraine show voters are resigned to it – at least for the moment. Everything’s coming up roses in Kiev, according to our clueless President: Poroshenko’s ascension means not only an end to corruption but also signifies that the coup leaders are moving on to a New Day in which "they reject violence." This was said shortly after Poroshenko ranted that he intended to "crush" the "terrorists," and as rockets struck civilian centers in the east. Meanwhile, the War Party’s propaganda machine is furiously churning: "The Interpreter," a new web site funded by Pavel Khodorkovsky, son of notorious Russian oligarch Mikhail Khodorkovsky, and edited by neocon Michael Weiss, is claiming that Russians are streaming across the border. The long-awaited "imminent" Russian invasion of Ukraine proper has arrived! Except that it hasn’t – oh well, back to the drawing board, Weiss! Weiss and his fellow neocons have been announcing an "imminent" Russian invasion for the past few months. They seem to have fallen victim to the Seventh-Day Adventist syndrome: when the Apocalypse fails to materialize as prophesized, just keep pushing back Judgment Day – and Keep Hope Alive! Talk of a Russian invasion is nonsense. Putin isn’t stupid, and one would think his Western adversaries would’ve realized this by now. The last thing he wants is possession of the archaic industrial eastern provinces of Ukraine, where uneconomic Soviet-era factories churn out goods hardly anyone wants to buy and the cost of paying off pensioners alone makes annexation too costly to contemplate. Apart, that is, from the diplomatic and political costs of launching a Crimea-style operation. Indeed, the "pro-Russian" rebels are now vigorously denouncing Putin and the Russian government for not extending aid and refusing to consider annexation. The "People’s Republics" of Donetsk and Luhansk are declaring they don’t need Putin or Russia and instead want complete independence. This anti-Putin rhetoric is nothing new: it was implicit in the rebels’ rejection of the Geneva pact, in which Putin and Lavrov went over their heads and signed an agreement deciding their fate without consulting them. It became explicit when the Donetsk Republic leaders defied Putin’s call to delay their referendum and voiced their dismay at the lack of aid. The last straw was the Russian leader’s pledge to "respect" the results of the election that elevated Poroshenko to the presidency. The neocons are holding busy little seminars on the Russian "threat," and the supposedly expansionist policies of Putin’s government, but the reality is that Putin has no interest in reestablishing the old Soviet Union, which collapsed due in part to its sheer vastness. He is fighting a defensive war against Western attempts to not only bring NATO to the gates of Moscow but also to destabilize his regime. 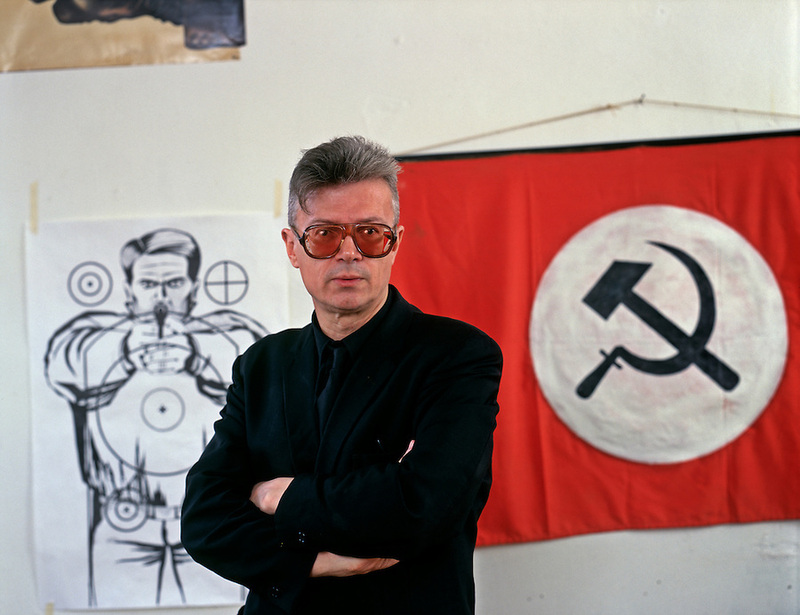 Various Western "NGOs" have openly aided groups advocating the violent overthrow of the Russian government, including Eduard Limonov’s National Bolshevik Party acting through its front group, known as the "Other Russia." When the Russian authorities kicked Western NGOs out of the country – for activities that, if engaged in here in the US, would be clearly illegal – the Western media noted Putin’s alleged similarities to Joe Stalin. There is, however, one notable dissimilarity: while Stalin had plenty of Western apologists in the major media, including the New York Times’ Walter Duranty, Putin only has "Russia Today" and Dana Rohrabacher. This is the great anomaly: the dark mystery of continuing neocon hatred directed at Russia even after the overthrow of the Communists. All during the cold war, we thought the neocons were pushing for World War III with the Kremlin because these "liberals mugged by reality" were fanatical anti-communists, and longed for the day when the "worker’s paradise" was no more. Well, that day has come and is now long gone, and yet still anti-Russian fanaticism is a major theme of neocon propaganda. So it wasn’t anti-communism that set Norman Podhoretz and his battalions of laptop bombardiers into battle with the Kremlin – there is something else going on there that will probably require calling in a couple of psychiatric experts to suss out. Pending that investigation, one can only wonder at the degree of venom unleashed against the Russians ever since they had the temerity to overthrow Communism. Saddled with a drunken lout of a "President" in Boris Yeltsin, the West’s front man and the plaything of oligarchs, Russia went steadily downhill and the country seemed on the verge of economic and social dissolution. Whatever one may say of Putin, he threw out the oligarchs (who are now financing much of the ubiquitous anti-Russian propaganda) and halted the rapid decline, even if he didn’t quite succeed in reversing it. Russia is very far from a Jeffersonian republic, but in an era when authoritarianism seems to be on the march internationally – including right here in America – Russia’s course is in the opposite direction: away from the Stalinist totalitarianism of its dark past and forward to a relatively freer form of government. In spite of this, the hostility of the West shows no signs of abating; indeed, Russia is now being treated just as it was during the cold war – as an enemy, subject to sanctions and regular denunciations by our State Department. Washington is sending military aid to Ukraine and directly financing Kiev’s brutal "anti-terrorist" campaign in the eastern part of the country. We are, in short, paying for the commission of war crimes. Every member of Congress who voted for this aid "package" ought to hang his or her head in shame. It’s an outrage that our tax dollars – and moral support – are going to the Poroshenko government, which has no more legitimacy than the military junta which recently overthrew the government of Thailand. We need a new two-word policy in Ukraine: bud out!